Being a photographer or videographer is not easy, as you need to deal with all sorts of challenges and all kinds of people. But animal photographers are among those I admire most. It’s difficult to capture animals and make them do what you want. With them, you almost never know what they will do. Sometimes even the wild animals are sweet, and they come for a cuddle. And other times, they want to see what you taste like. And this is exactly what happened to this cameraman while filming sea lions under water. I watched this video dozens of times this morning. 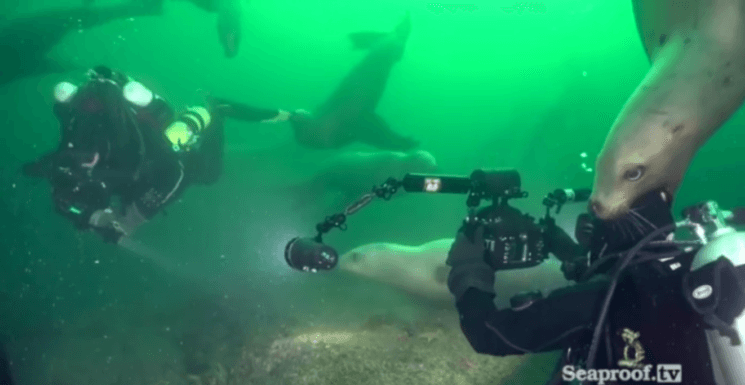 As if it wasn’t difficult enough to film underwater, this sea lion tried to have a bite of the cameraman’s head. Although these creatures are generally not dangerous, it can happen that they attack people. Still, to me as a layperson, this doesn’t seem like an attack on a human. Maybe the animal thought the man’s head was an octopus and tried to catch it. It looks something like it, and it might have been painful. Fortunately, the sea lion let go pretty quickly when it realized that wasn’t food. Because it ended well, I found this video amusing. It’s an unusual situation, but I think it illustrates what being an animal photographer (or in this case, videographer) looks like. Buster Bluth unavailable for comment.